Ibaraki is well-known for its rich nature. The area is especially beautiful in the fall, offering spectacular views and seasonal dishes. This itinerary takes you to the famous Ryujin Big Suspension Bridge and to a splendid fall spot in Mito City. If you visit Tokyo in the fall months (October, November, the beginning of December), an activity that you shouldn't miss out on is going on a day trip outside the city to a nature-rich place and enjoy the fall colors. Ibaraki, located north of Tokyo, is particularly famous for its fall spots. Here you'll find a wide palette of colors that will enchant you, making you appreciate the beauty of nature. In addition, the area is famous for its tasty soba noodles, which can be enjoyed fresh, tasting their best, in November. In this article, we introduce an itinerary that will take you to Ibaraki's world-famous Ryujin Big Suspension Bridge, with surroundings are breathtakingly beautiful in the fall, and to a spectacular fall spot in Mito City, the gingko tree alley of the Ibaraki Prefectural Archives and Museum. To make the most out of your fall trip to Ibaraki, we suggest leaving early in the morning from Tokyo. The nearest train station to the Ryujin Big Suspension Bridge is Hitachi-Ota. You can reach Hitachi-Ota Station by taking the limited express Hitachi departing at 7:00 from Ueno Station and changing trains at Mito Station. You'll arrive in Mito at 8:10 and you can make it to the 8:17 train departing from platform no. 2 for Hitachiota City. You'll be arriving at 8:49 at Hitachi-Ota Station. The bus heading to Ryujin Big Suspension Bridge departs at 10:02 from the bus stop in front of the train station. This leaves you about one hour to take a walk around the city. If you exit the station through the main exit and walk straight ahead for about 8 minutes, you'll reach the residential area and its picturesque shopping street. It's a place where you can get a feel of the locals' lifestyle. The Tourist Information Center within Hitachi-Ota Station opens at 9:00 so you can check out the latest travel information for Hitachiota and grab some of the local treats that are on sale there. When you get off the bus, you'll have the bridge right before your eyes! Not only is it impressive through its sheer size, but the vivid contrast it creates against the fall color background is simply breathtaking. The Ryujin Big Suspension Bridge was opened in 1995. It is a 375 m long pedestrian bridge spanning over the Ryujin Gorge. Famous for the splendid views it offers, it has become a sightseeing destination that attracts thousands of domestic and international travelers each year. 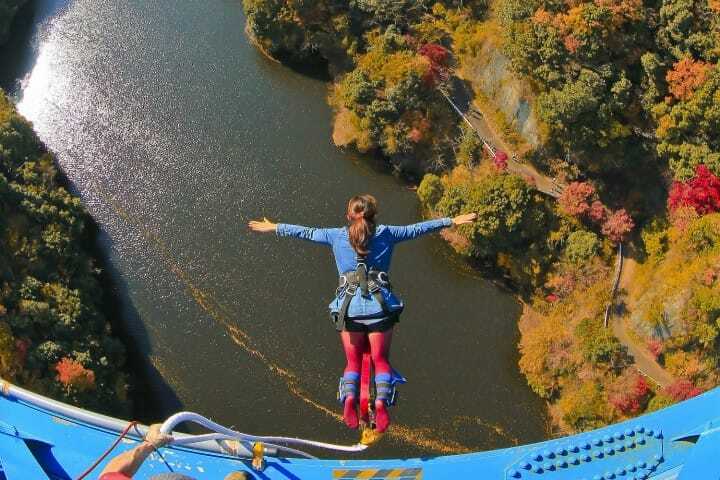 This bridge is especially famous among bungee jumping enthusiasts. Located at 100 m above the Ryujin Gorge, it allows the highest jump in Japan. In fact, while you're there, you might be able to witness some of the jumps. If you'd like to experience the Ryujin bungee jump yourself or would like to watch the jumpers from the cabin where they jump from, please contact Bungy Japan, the association that organizes these activities. Access Approx. 50 minutes by bus from HItachiota Station. Take the bus from bus stop no. 1 located in front of the station and get off at Ruijin Otsuribashi bus stop. At each end of the bridge there is artwork depicting a dragon ("ryujin" in Japanese). These mythologcal creatures are believed to be commanding the power of water, that is why they are often represented flying over the waves. The view from the bridge itself is stunning! The Ryujin River with its clear waters meanders through the valley. It got its name from its shape that resembles the shape of a dragon. The foliage of the surrounding mountains changes to beautiful colors in the fall. The bridge is a great spot for taking wonderful pctures. Once you get to the other side, you can go down the stairs into the valley and watch the bridge from below. Please be aware that if you get out the barrier at the end of the stairs, you won't be able to go back the same way. Go to the left, in the direction of the bridge and the dam. Cross the dam and you can climb the stairs going up to the bridge entrance. To enter the bridge for the second time, you'll have to pay the entrance fee again. The hike will take about 20 minutes if you climb at a moderate pace. It will be a pleasant walk among the fall colors of the Ryujin Gorge, which offers stunning views that make great material for beautiful pictures. At the entrance to the bridge that goes over the dam to the other side of the river, there is Ryujin Cafe, a cozy, friendly place where you can sip a warm drink while enjoying a great view of the bridge. Access About 50 minutes by local bus from Hitachiota Station. Take the bus from bus stop no. 1 located in front of the station. Get off at Ryujin Otsuribashi stop. Right near the entrance to the Ryujin Big Suspension Bridge, there is a souvenir shop and restaurant called Mori no Kaze. The restaurant occupies the second floor. It is a wide, welcoming dining place with a great view over the suspension bridge. It's also one of the best places to take pictures of the bridge too! The restaurant offers a wide variety of dishes, from rice bowls with seasonal toppings to tempura and noodles. If you visit in November, we recommend tasting the Akisoba Noodle Set (1,000 yen), a November-limited buckwheat noodle menu. Akisoba means "autumn soba" and refers to the noodles made with fresh buckwheat. You can tell that it's fresh by its color, which still has a greenish hue, and by the firmness of the noodles. At Mori no Kaze, you get to taste the soba in combination with four types of toppings such as tempura, grated yam, mushrooms, and fried vegetables. It is a very tasty, filling but at the same time refreshing dish. The Hitachi Akisoba, a specialty of Ibaraki, is truly delicious and there are people coming from the surrounding prefectures in the fall just to enjoy this dish. There is a bus leaving for Hitachi-Ota Station at 14:16. It departs from the bus stop near the entrance to the bridge. Please note that the next and last bus of the day leaves at 17:11 so if you plan to visit other places on the same day, please make sure you don't miss this bus. In order to reach our second highly recommended autumn spot, the Ibaraki Prefectural Archives and Museum, we first have to go to Mito Station. There is a train departing for Mito at 15:14 that will take you directly to the destination. The fare is 320 yen. Once you reach Mito Station, use the North Exit and take the bus from platform No. 4 which goes to the Ibaraki Museum of History and Kairakuen Garden. After an approx. 14-minute ride (240 yen), please get off at Rekishikan Kairakuen Iriguchi bus stop. The Ibaraki Prefectural Museum of History is right across the street. The Ibaraki Prefectural Archives and Museum is an institution dedicated to researching the history of Ibaraki. The permanent and temporary exhibitions hosted by this museum offer insights into how this area developed from ancient times to this day. The largest part of the Hitotsubashi Tokugawa Family Memorial Collection, which can be seen here, consists of historical objects that once belonged to the Hitotsubashi clan, which was related by blood to the Tokugawa shoguns. Adjacent to the main building, there is the Former Mitsukaido Elementary School Building, a structure that was built in the Meiji Period (1868-1912). The building might attract your attention through its Western facade, which reflects the architectural trends of early modern Japan. If you make it to the museum before 17:00, take a few minutes to enter and see the exhibits. One of the rooms has an exhibition of school lunches from the Meiji times to this day, while in another room there is a Steinway & Sons piano exhibited, which happens to be the oldest piano of this brand in Japan. The highlight of our fall visit to the Ibaraki Prefectural Archives and Museum is the Gingko tree alley of the museum, which is lit up in the evening for several days in a row at the beginning of November. The view of the gingko trees and their yellow foliage is truly fantastic! Even if you don't make it on the days of the Gingko tree row light up, you will still be able to enjoy the beauty of this tree row and its splendid foliage through the whole month of November. To return to the station, take a local bus from the bus stop located in front of the main entrance. Access About 10 minutes by bus from Mito Station's North Exit. Take a bus heading in the direction of Kairakuen Garden from bus stop no. 4 and get off at Rekishikan Kairakuen Iriguchi bus stop. Price During special exhibitions: Adults 600 yen, Seniors (over 70 years of age) 300 yen, College students 310 yen. Outside of special exhibition days: Adults 150 yen, Seniors 70 yen, College students 80 yen. The limited express train Hitachi heading to Tokyo's Shinagawa Station is departing at 18:27. We recommend arriving earlier at the station so that you have time to reserve your seat. If you have some time at your disposal, why not check out the souvenir shops located within the station? Mito is especially famous for plums (ume) so there is a wide variety of plum-flavored sweets and snacks to choose from. Ume monogatari (shown above in the pink colored package) are delicate jelly sweets with a refreshing plum-flavored filling. The plum liqueur (umeshu) made in Mito is also a local specialty. It is very aromatic and delicious. Please note that it has an alcohol content of over ten percent, which is double the average of regular plum liqueur. A trip to Ibaraki in the fall will leave you with long-lasting, precious memories of the beauty of nature in the fall. Not only the views but also the local dishes that are only available at this time of the year make it worth going on a day trip out of Tokyo to this region.